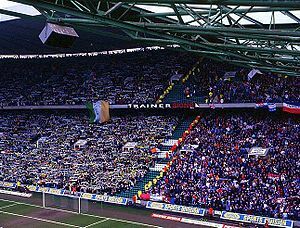 Both sets of fans at an Old Firm match at Celtic Park. The Old Firm is the name given to the relationship between two football teams in Scotland, Rangers F.C. and Celtic F.C. The two clubs are the most successful in Scotland, having won between them 63 Scottish Cups and 93 Scottish Premier League championships (as of 2007). The two clubs normally compete four times a year in the SPL and are regularly drawn against each other in the two Scottish cup competitions. The clubs' have large support bases around Glasgow, but also have supporters clubs in most towns throughout Scotland and in many cities around the world. The presence of Rangers and Celtic has been estimated to be worth £120 million to the Scottish economy. The two clubs' fan bases have historically been divided on religious lines. Celtic are supported by Catholics, while Rangers are supported by Protestants. There have been many high profile players to play for both sides of the Old Firm. The most recent players to do so are Kenny Miller, Maurice Johnston, Steven Pressley, Mark Brown and Barry Robson. Kenny Miller is the first player in the modern era to cross the Old Firm divide twice, having played for Rangers then Celtic, then moving back to Rangers. ↑ Murray, William J. (1984). The Old Firm: sectarianism, sport, and society in Scotland. Edinburgh: J. Donald Publishers; Atlantic Highlands, N.J.. ISBN 0-85976-121-5. ↑ "Old Firm". Rangers official website. Retrieved 2006-09-05.